Sol–gel silica antireflective (AR) coatings possess a high specific surface area that is more susceptible to be contaminated by absorption of contaminants from the environment, which will increase the refractive index and reduce the transmittance. Ammonia and γ-methacryloxypropyltrimethoxysilane (KH570) vapor treatment was employed to passivate the silica AR coating, thereby enhancing the environmental stability. The properties of the coatings were characterized with Fourier transfer infrared absorption spectroscopy, scanning electron microscopy, atomic force microscopy, UV–Vis–NIR spectrometer, and contact angle measurement. The results showed that after the vapor treatment, the coatings became denser and the environmental stability was greatly improved. After being exposed to a humid environment (RH > 90%) and low-vacuum environment with intentionally induced organic contaminants for 60 days, the transmittance of the modified SiO2 coating decreased by only 0.08% and 0.2%, respectively. 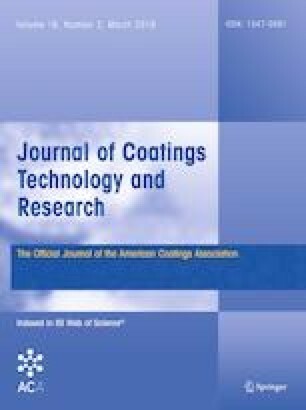 Meanwhile, the average transmittance decreased by only 0.02% after being rubbed for 1000 cycles, indicating that the co-treated coating also possessed a good abrasion resistance. This work was financially supported by the National Key Research and Development Program of China (2017YFA0204600), National Natural Science Foundation of China (Grant No. 11304228), “Chen Guang” project supported by Shanghai Municipal Education Commission and Shanghai Education Development Foundation (Grant No. 14CG19), and Fundamental Research Funds for the Central Universities.